This truck has oversized tires with sturdy molded axles. 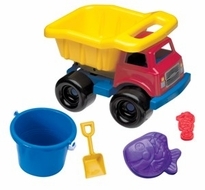 The large dump bed holds two sand tools, sieve, 6" castle mold and two large sand shapes for creative playing. Dimensions : 15.75" x 10.5" x 11.875"